All tours can be adapted to school groups, independent travellers or adult groups! The city of Saint-Malo was founded in the mid-XIIth Century. 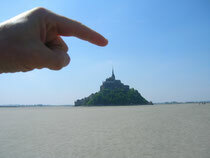 It is located on the Emerald Coast in the North-East of Brittany. The city, which used to be an island, has understanbly a very strong relation to the sea. Most of its long and vibrant History relates to it. During this walking guided tour of Saint-Malo, we will wander through the oldest parts of town to discover its ancient architecture, breathe the nice sea breeze on the ramparts and discover the hidden beauties of the last medieval parts of town. Of course, a guided tour of Saint-Malo would not be complete without talking about its recontruction during the 1950s. Indeed, after losing 80% of its original setting during the August 1944 Liberation Battles, the reconstruction of Saint-Malo can today be considered as one of the most heritage-conscious in the country. The Mont Saint-Michel, one undoubtedly amazing World-Heritage listed Monument with two sides to it: its military appearance with its city walls and towers dating from the Hundred Years' War and the religious side with its thousand-year old Abbey. Walking through the small streets of Mont Saint-Michel, we will discover the life of this very peculiar Normandy village and then, after having "climbed" the Pilgrims' staircase, we will enter the Abbey and explore the beautiful complexity of its Romanesque and Gothic monasteries. Feeling like seeing medieval ramparts, half-timbered houses, amazing religious heritage, cobbled streets filled with art galleries and crafts shops? You must visit Dinan!! Dinan is without doubt one of the most attractive and best preserved small towns in Brittany. Its old town is a warren of narrow streets where it appears that time has stood still. But it has now also developped as a big centre for Arts and Crafts : the town is filled with artists, sculptors, engravers, bookbinders, glassblowers and more. This walking guided tour will give you the possibility to step back in History, at the time of the Breton Dukes when Dinan became one of the major Breton trading port city.